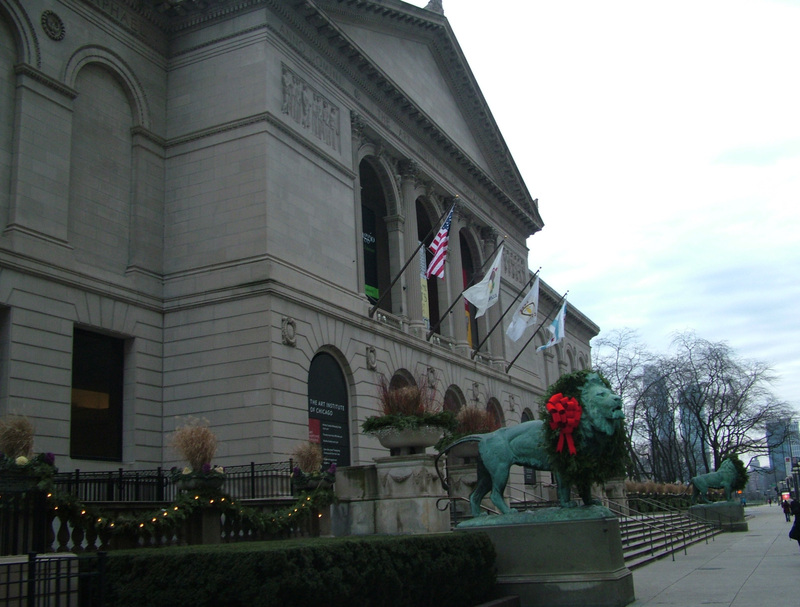 Most people think of the School of the Art Institute of Chicago as the institution that resided above and below the museum it gave birth to over a century ago. Yet for over 30 years the school has had its own building and in the last 20 years the School has grown even more, filling five different buildings in the Loop and occupying space in even more. In 1976 the School occupied the Walter Netsch modernist building on Columbus Drive behind the museum, and 12 years later it purchased the Champlain Building, now the Sharp Building. 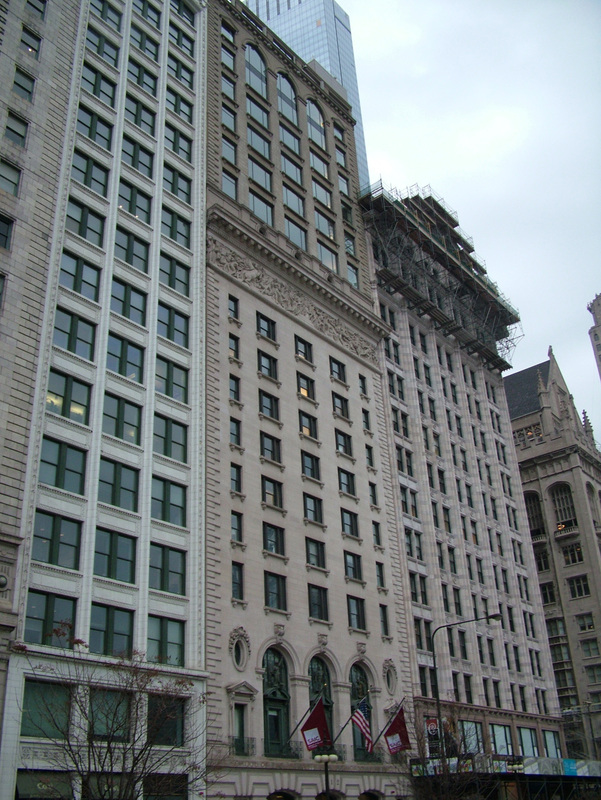 A couple of years later it bought the old Illinois Athletic Club building (1908, Barnett, Haynes and Barnett) as a dorm, later converting it into classrooms and renaming it the Maclean Building. 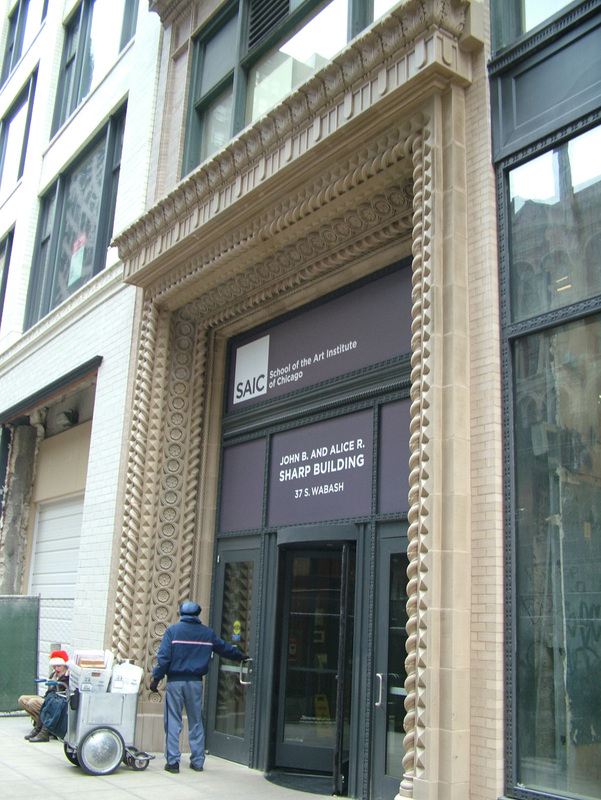 A few more years and SAIC turned the Chicago Building (1904, Holabird & Roche) into a dormitory, which was particularly gratifying to me because I had helped save it from demolition in 1989 when I worked at Landmarks Illinois. The School also saved a 1917 Christian Eckstorm Building on State Street and incorporated it into a new dormitory by Larry Booth, a building I had the pleasure of teaching in last year. 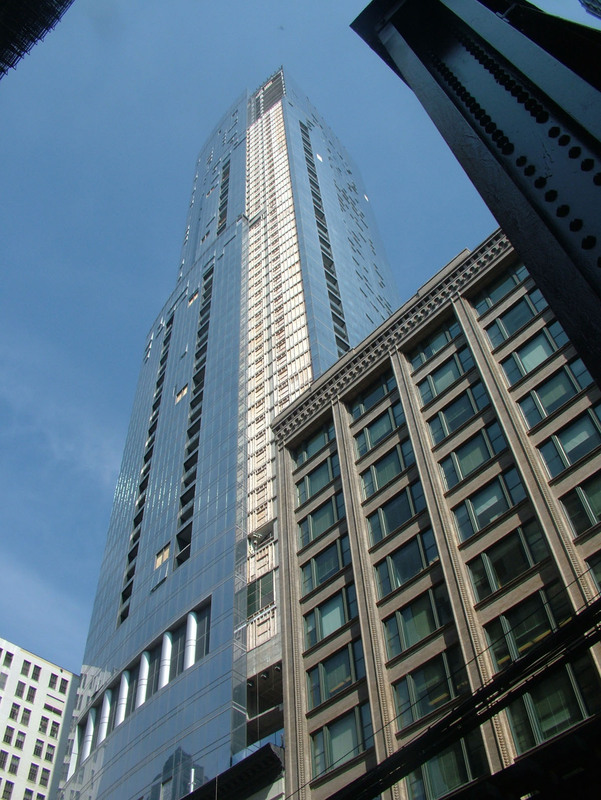 But I want to talk about the place I have taught for the last 15 years, the Sharp Building at 37 S. Wabash. The Sharp Building was originally built in 1902 for the Powers school, which taught clerical skills like German, stenography and bookkeeping. 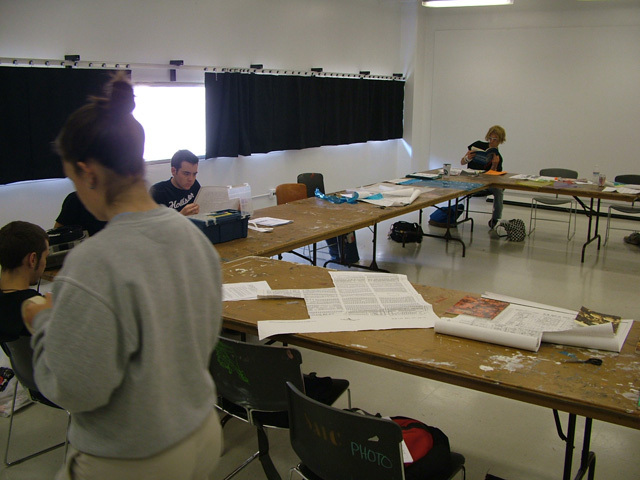 My Research Studio students – first year BFA candidates – are working on an exhibit interpreting the history of the building, which is appropriate since it has just been restored. This is also the building where we have our Master of Science in Historic Preservation studios, lab, resource center and faculty offices. 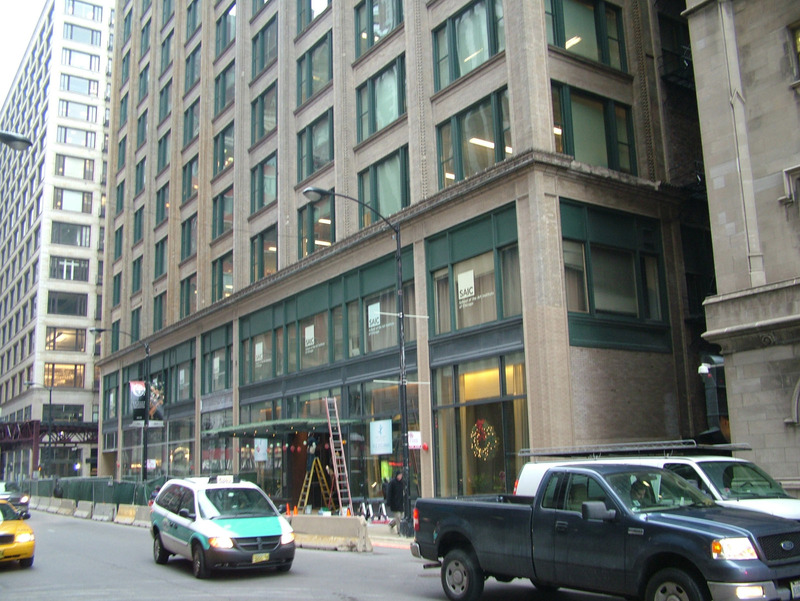 We used to be on the 13th floor but now we are on the 10th, where we have two large studios overlooking the corner of Monroe and Wabash Streets. 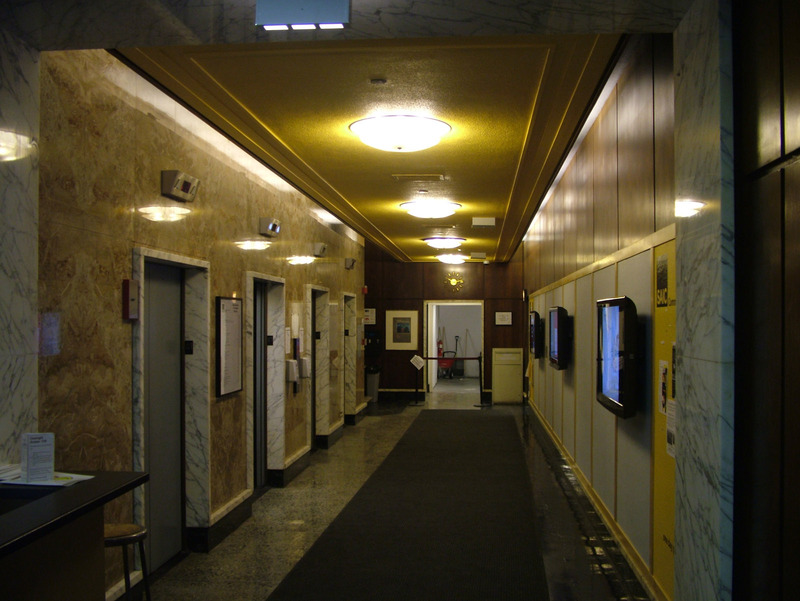 The building’s entrance and ground floor has just been restored to the original Holabird & Roche design, which involved recreation of the elaborate terra cotta entrance, largely destroyed in the 1933 remodeling as the Champlain Building. 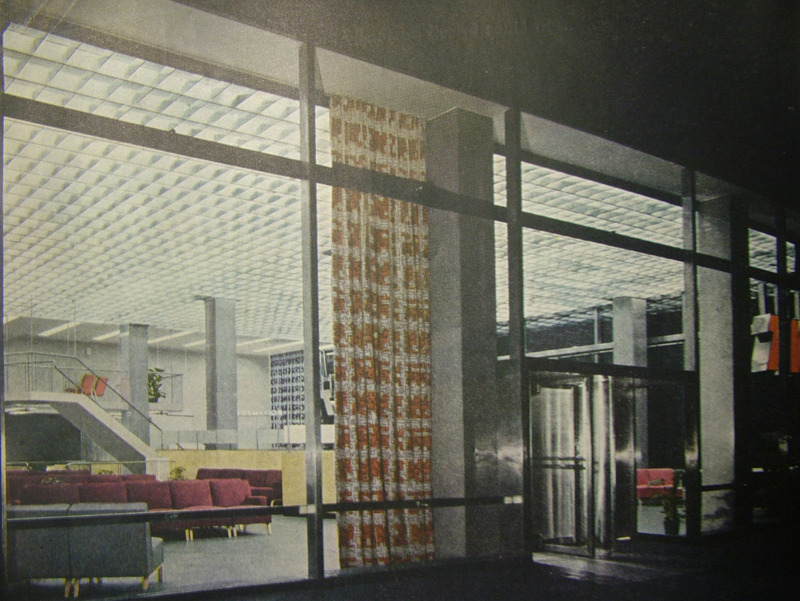 The restoration also involved bringing back the brick piers which originally defined the ground floor, lost in the 1947 Skidmore, Owings and Merrill transformation into a TWA ticket office. There is a lot of fascinating history here: When TWA was selling airplane tickets here in 1947, Ludwig Mies van der Rohe was on the 9th floor designing the Farnsworth House. 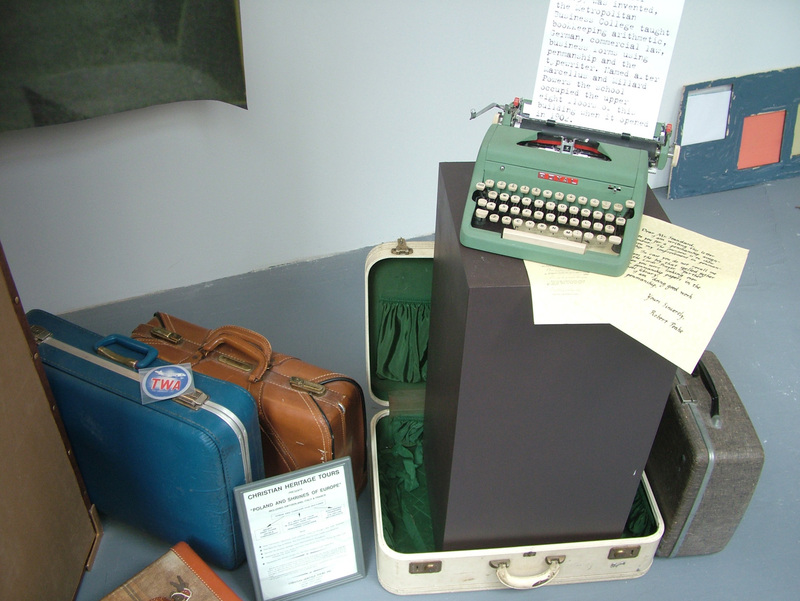 Thirty years later, my father had a travel business in the building. The TWA ticket office turned into a restaurant and then later into a bank and again into a restaurant before closing a half dozen years ago. 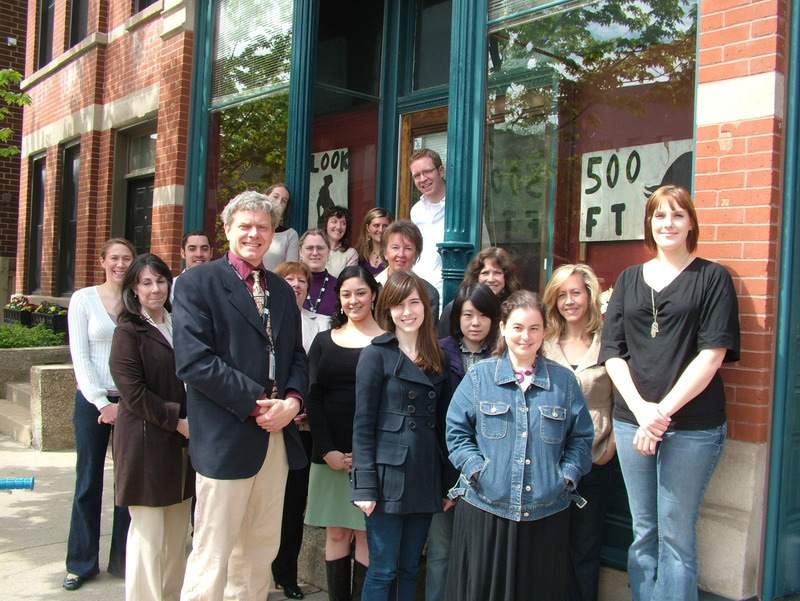 Our program began in the building in 1993, the same year it was DENIED landmark status. 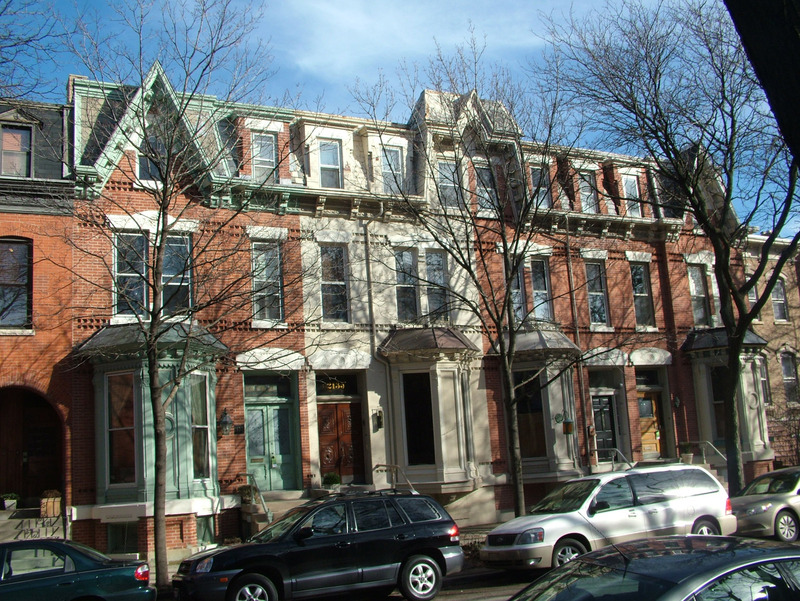 Later in the 1990s it was landmarked as part of the Jeweler’s Row district. 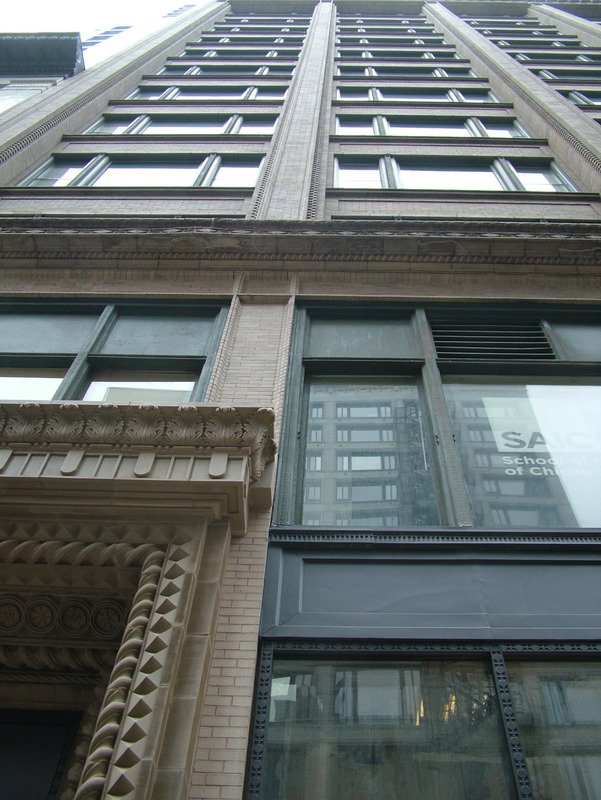 A controversial project saved the facades of three Jeweler’s Row buildings for the new 80-story Legacy highrise. 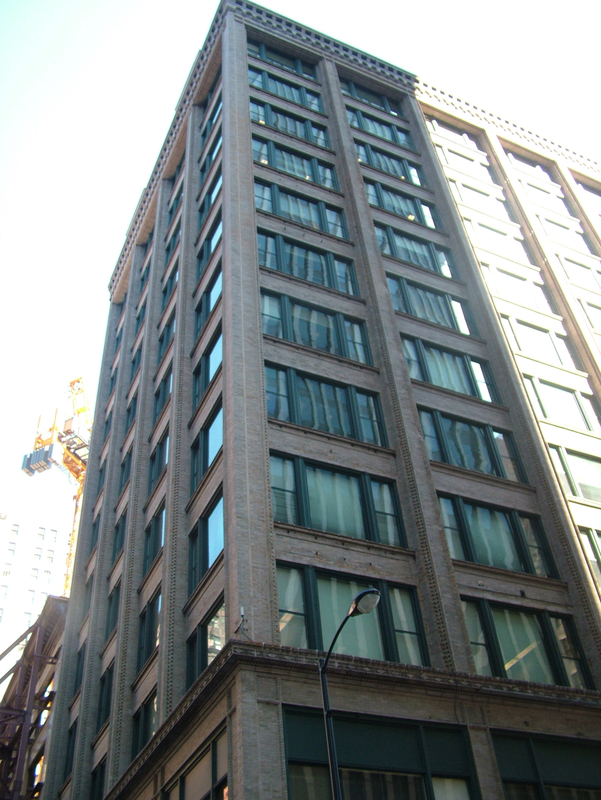 That project is responsible for the restoration of the Sharp Building’s ground floor, which has just debuted this month. It is exciting for our historic preservation graduate students to work in a building that is seeing such a sensitive restoration, expecially after the disappointing replacement of most of the original windows a decade ago. That’s the BEFORE – note the profile and depth. That’s the AFTER – butchered and blinded. And they’re aluminum which means they are REALLY COLD right now. 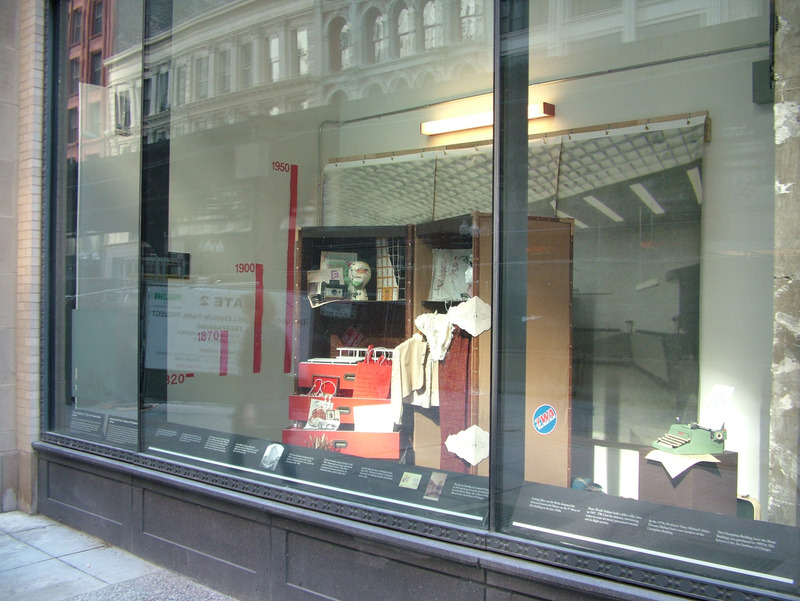 This was one of the events which kicked off my window rants back in ’01. Our class even produced alternatives to replacement, to no avail. 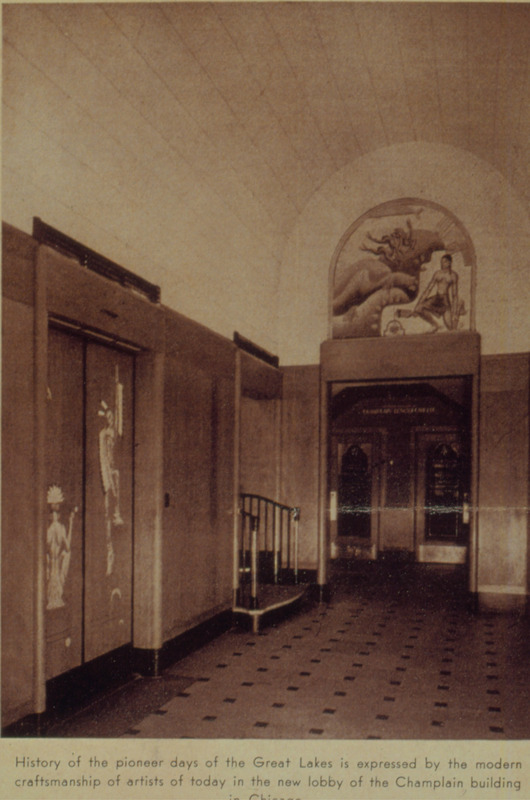 The lobby has bits of each period – we apparently still have – in storage – the elevator doors decorated with relief French and Indian figures during the 1933 remodeling by onetime SAIC dean Hubert Ropp, who also designed lunette murals, long lost to a dropped ceiling. My BFA students are exploring all of these themes as well as the history of the corner of Monroe and Wabash, which includes the legendary Palmer House hotel, and the Sullivan facades recently revealed on Wabash Avenue across the street, on buildings incorporated into the Louis Sullivan designed Carson Pirie Scott store at the turn of the last century. It is a great place to work, and an especially great place to teach the many arts and sciences of heritage conservation. Earlier this year a Chicago lawsuit hobbyist with lots of money and neighbor-management issues got the Illinois Appellate Court (“Precedent? We don’t need no stinking precedent!”) to strike down the Chicago Landmarks Ordinance based on its “vagueness,” so naturally someone else thought they could pull the same sort of isolationist garbage elsewhere, namely Seattle. Turns out the Washington Court of Appeals rejected the “vagueness” challenge by recognizing the OBVIOUS: Landmarking is a process that encourages the preservation of historic sites, districts and structures, based on the criteria that those sites, districts and structures possess. This is not vague, it is entirely specific: you cannot detail what needs to be preserved in all situations because each sites, district and structure has its own individual characteristics that make it significant. 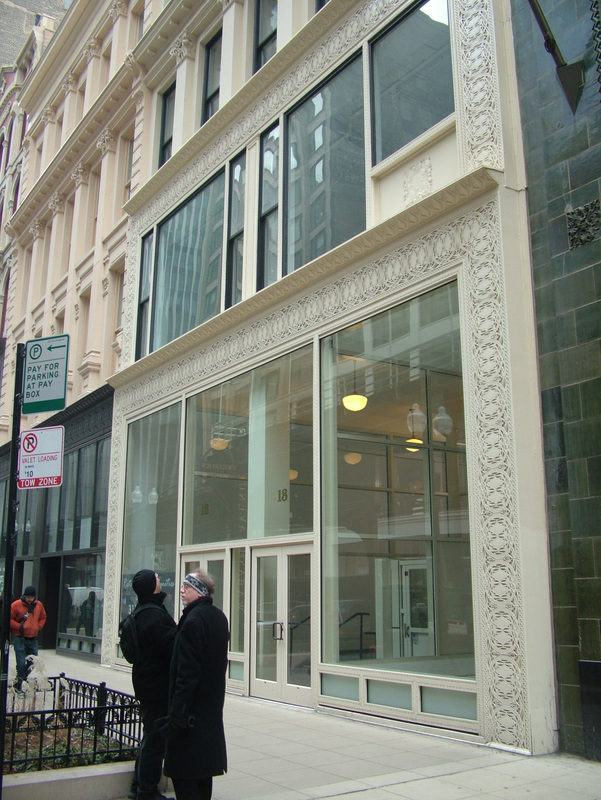 Landmarking treats buildings like individuals, not categories. This is what I have been saying all along (see my post “Appellate Nuttiness” on January 31, 2009). Now, I understand that people, and even judges, are more comfortable with absolutes and doctrines and everything being the same. But everything isn’t the same, or I could use my Epson printer inks in the Hewlett Packard, but I can’t. Turns out a vagueness challenge is one of the first things you learn, sort of a Lawsuit 101. See Gary Cole’s blog here. The crude medicine of basic zoning and building codes offer predetermined absolutes and specific standards: you must set back 5 feet, you are limited to this square footage, you are required to have this many exits, etc. Everything is the same and every building is treated the same, and you know what is going to happen before it happens and there is no vagueness. It is the sort of straightforward rules and procedures one needs to successfully operate a pre-school day care facility. But for grownups, the world has nuances. People are individuals, not numbers. Communities are individual as well. Oak Park does not equal Evanston and Palo Alto does not equal Santa Barbara and Mystic does not equal Marblehead and Nashville certainly is not equivalent to Knoxville. 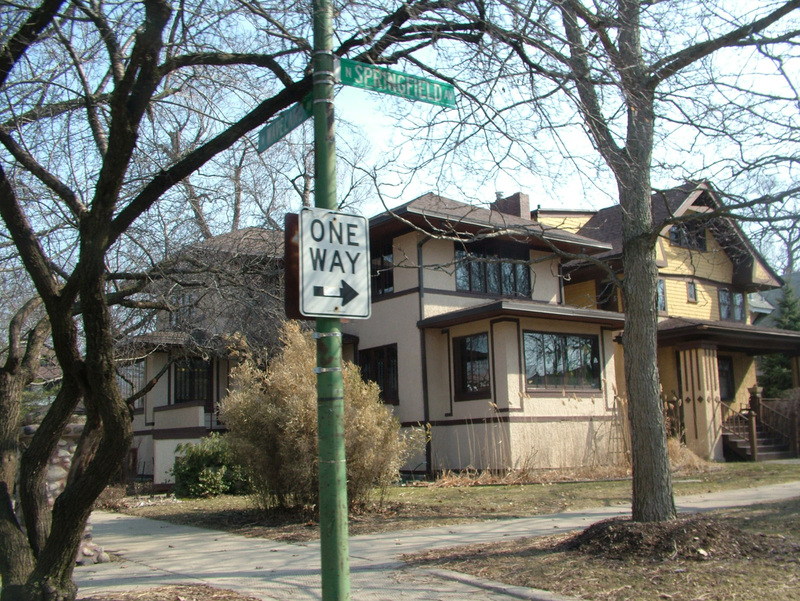 Within Chicago, the Villa does not equal Wicker Park and the landmark review process will not follow the same path on an Astor Street Georgian Revival that it will on a South Shore Foursquare. Landmarking is a PROCESS, and reviewing changes or additions to landmarks is also a PROCESS, and the rules are defined individually for each landmark. 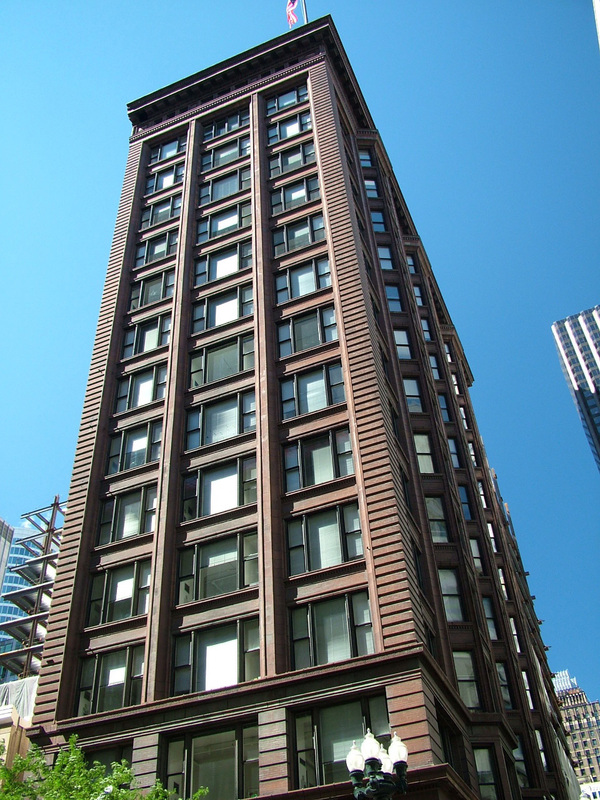 Every Chicago Landmark, when designated by the City Council, includes a list of significant architectural and historical figures so that every owner knows what is important about their building. But what is appropriate for a bungalow may not be for a Queen Anne, and vice versa. Here’s one for individualism. Thanks, Washington state. “Connor is denied on each and every count. I hope the good judges of Illinois’ Supreme Court read the decision. Deprivation of substantive due process – NOPE, landmark preservation is a legitimate state interest. Hidden indirect tax, fee – NOPE even had the SLPB required the stipulations Connor’s alleges (which they didn’t) it would’ve been in the service of mitigation in protection of the Ordinance 11022. 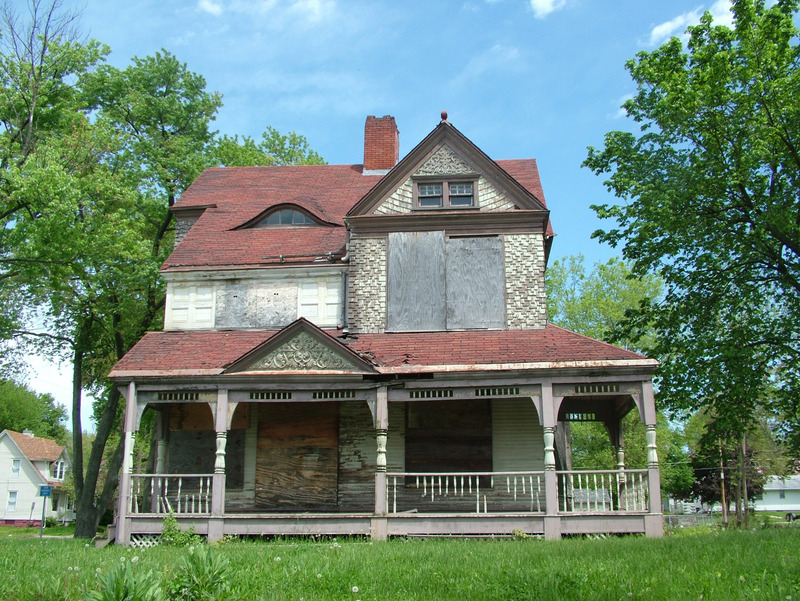 “The Landmarks Preservation Ordinance is impermissibly vague because it does not tell me exactly what I can do with my property” – REJECTED – Can Conner ascertain the requirements for an acceptable project? – YES – The LPO contains both contextual standards and a process for clarification and guidance as to individual sites. 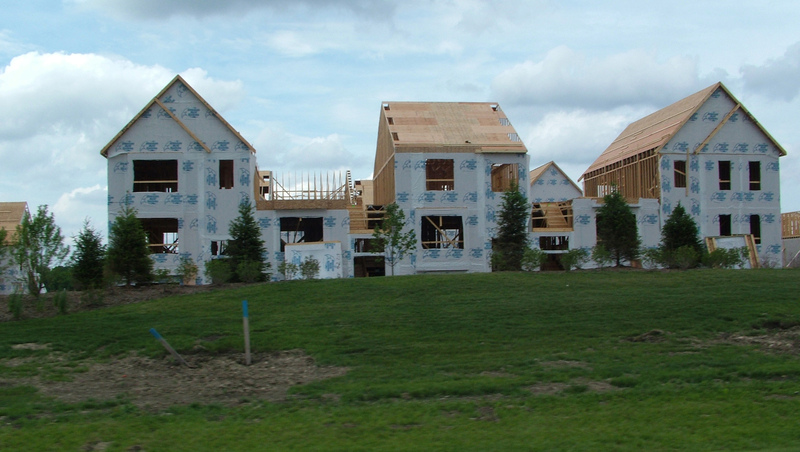 LPO and Ordinance 11022 describe specific features to be preserved with corresponding contextual standards for application. “The doctrine of vagueness does not require a statute to meet impossible standards of specificity” I like this one the best. “Clear Error” NOPE – Court reviewed hearing examiners review which was based on publicly passed Ordinance 11022, not the Report on Designation used by the Board. Lets all hope Hanna and Mwroka’s cases are as ham-fistedly argued as Connor’s was. 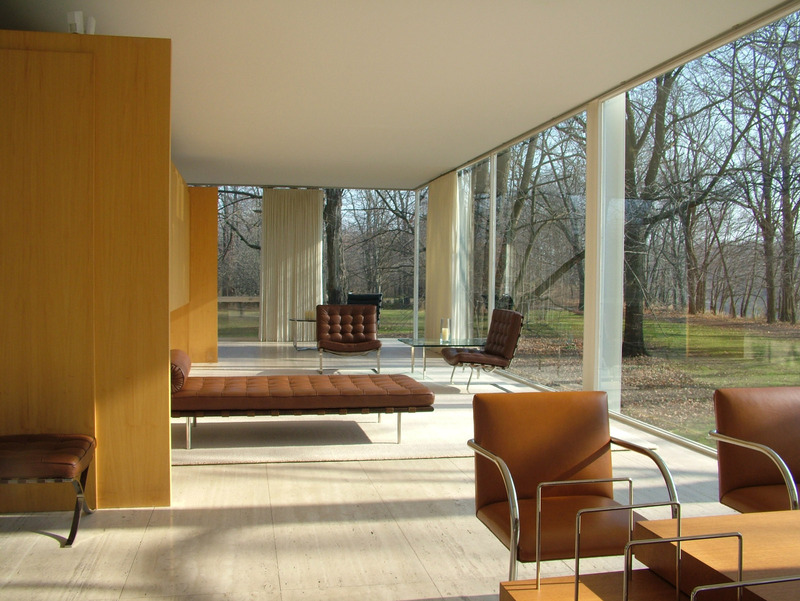 Thanks to Joan Pomaranc at AIAChicago for forwarding this! 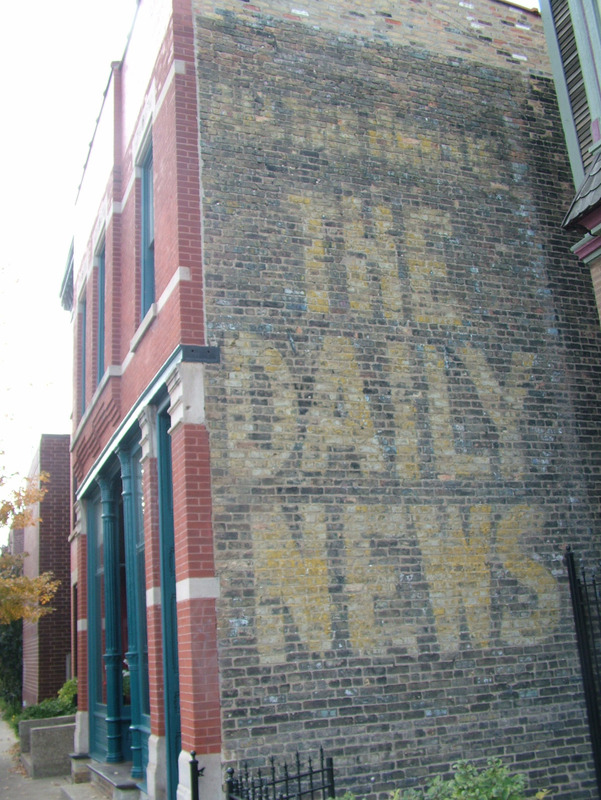 I have blogged several times about Hull House and its approaches to interpretation of historic sites – in fact, “Hull House Again” is my most-visited blog post. 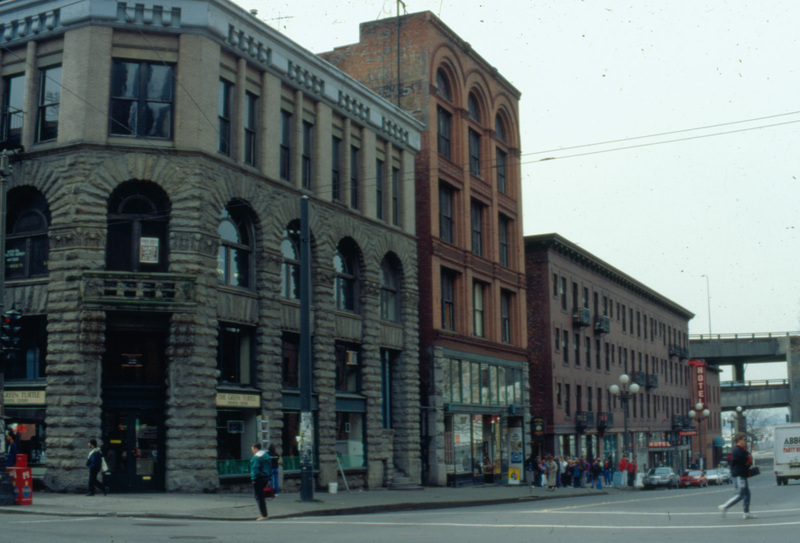 I have also blogged about the Gaylord Building on several occasions, where I served as Chair of the Site Council for six years. 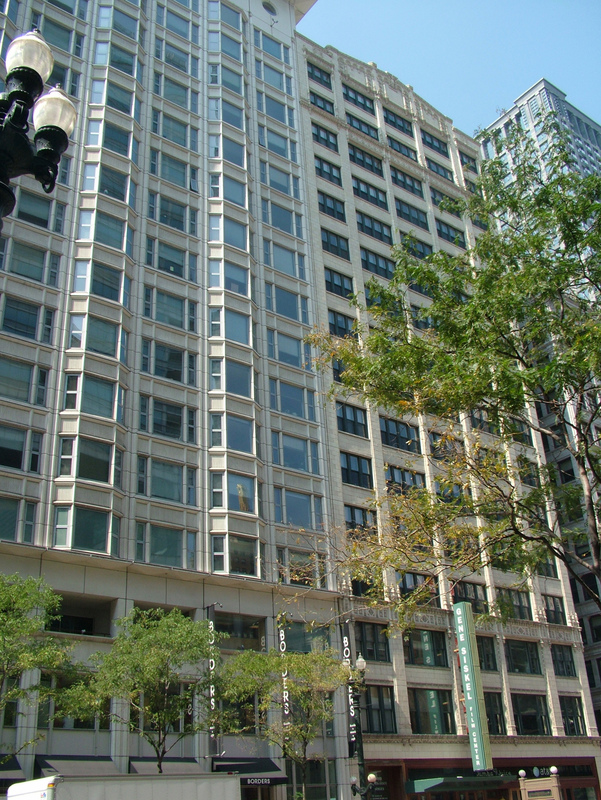 Another role of mine this decade has been as a member of the Roger Brown Study Collection Steering Committee, involved in the preservation, interpretation and educational implementation of the property and collection at 1926 N. Halsted in Chicago. 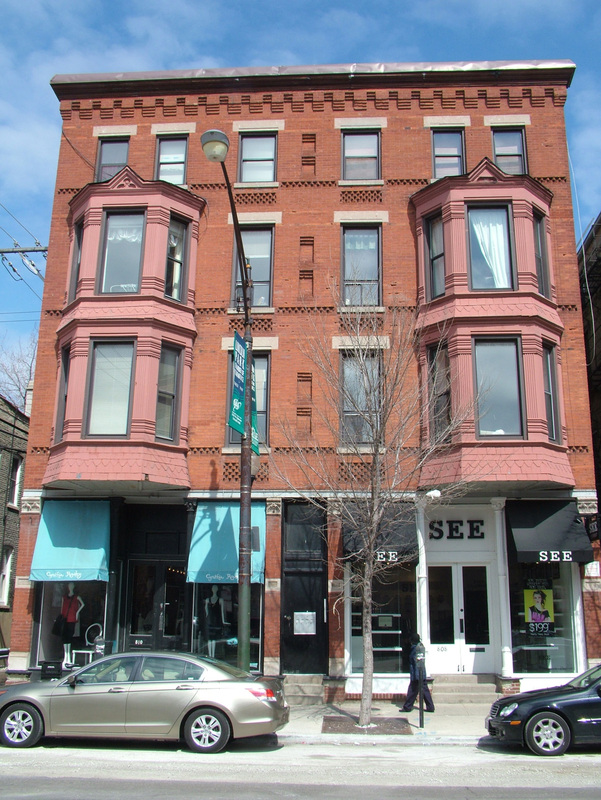 The site itself is an increasingly rare but once common two-story 1880s building that originally had a storefront and 3 apartments. 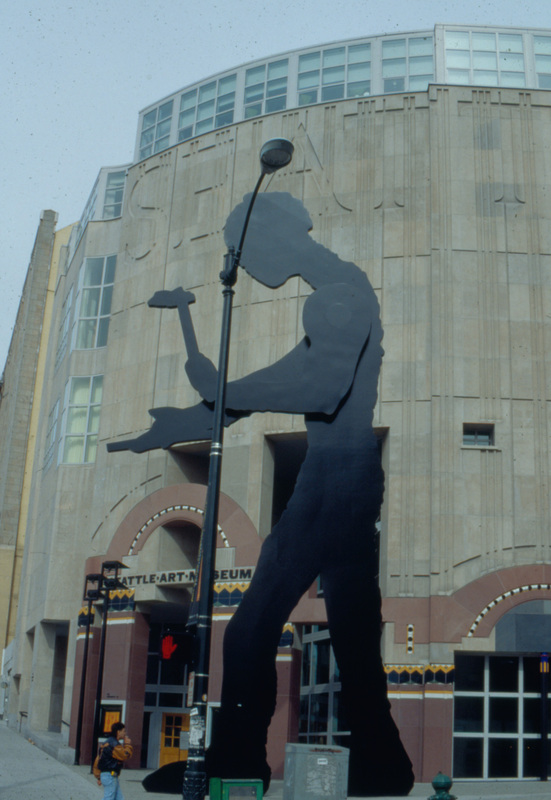 A successful and influential Chicago painter associated with a 1970s-80s group labeled the Imagists, Roger and his partner George Veronda converted 1926 N. Halsted into a studio and home beginning in the 1970s. 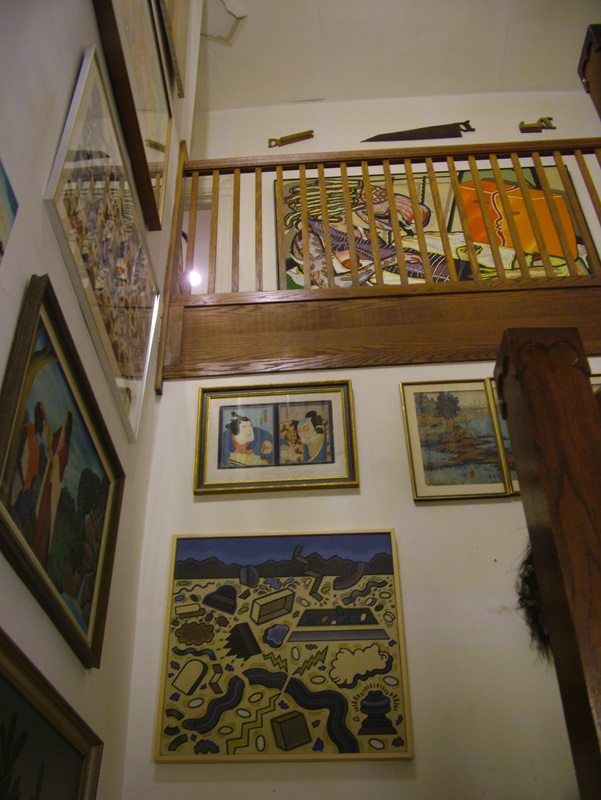 Over the course of two decades Roger produced much of his work here in his first floor studio and amassed a nearly overwhelming collection of art from the fine to the folk to the kitsch to the ephemeral that bedecks the second floor, the staircases and nearly every available space. 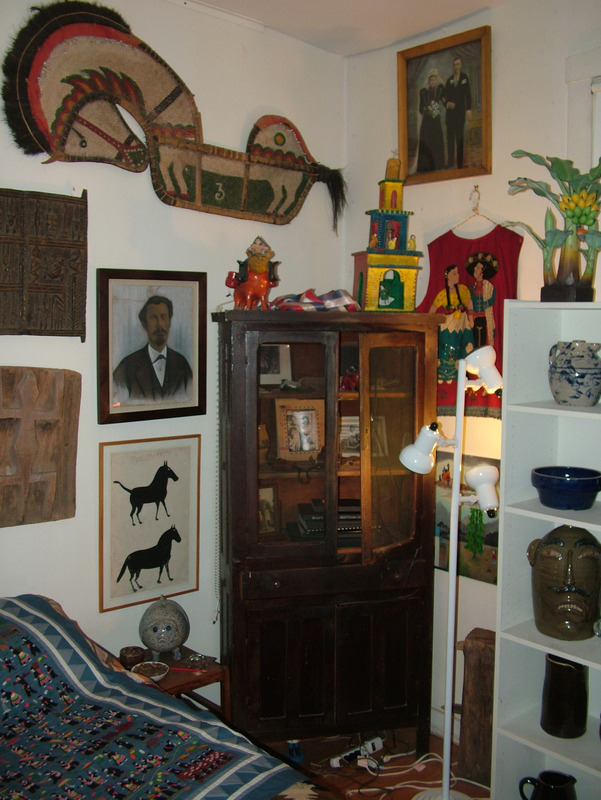 The place is literally packed with the collection as Roger had displayed it, or more appropriately, lived with it. My students both graduate and undergraduate really appreciate the place as a four-dimensional example of an artistic environment and as a stunning project of conservation and interpretation. 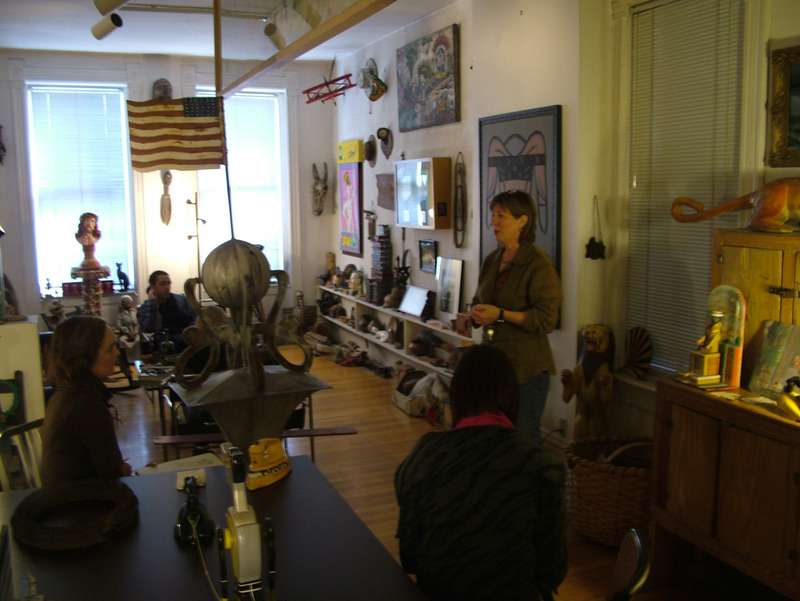 I serve on the Steering Committee with a roster of famous artists who knew and worked with Roger, and whose works are included in the collection, including Gladys Nillson, Jim Nutt, and Barbara Rossi. Nick Lowe from Arts Administration and Policy, is doing an amazing project documenting – and creating miniatures of – Roger Brown’s California home and collection, to be at Hyde Park Arts Center this spring. 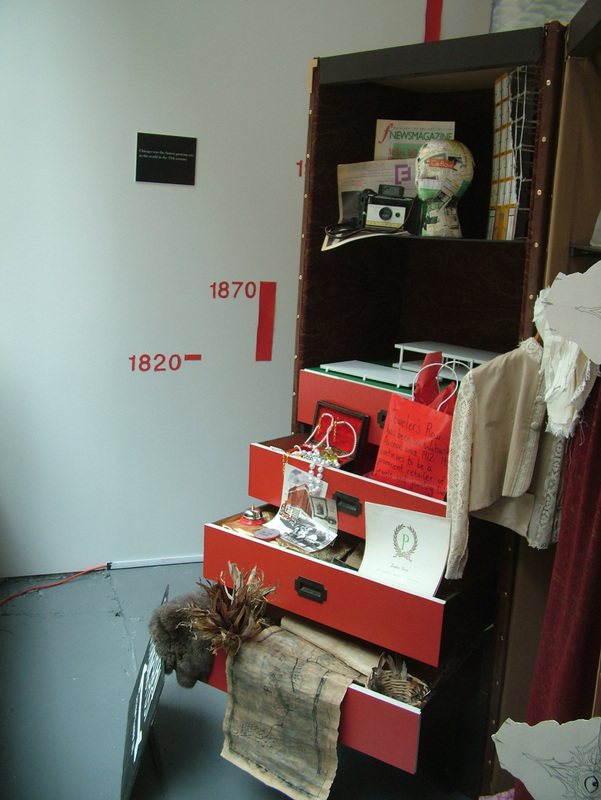 The incomparable Lisa Stone curates and manages the collection, and like her South Halsted counterpart Lisa Lee, has made the site an educational experience of uncommon depth. You always experience something new there. I had my students sketch whatever they liked in the studio and when I reviewed their sketches a couple of weeks later I saw things I had never seen. What strikes me about historic sites are the accidental details, the mundane but telling forensics of the everyday. 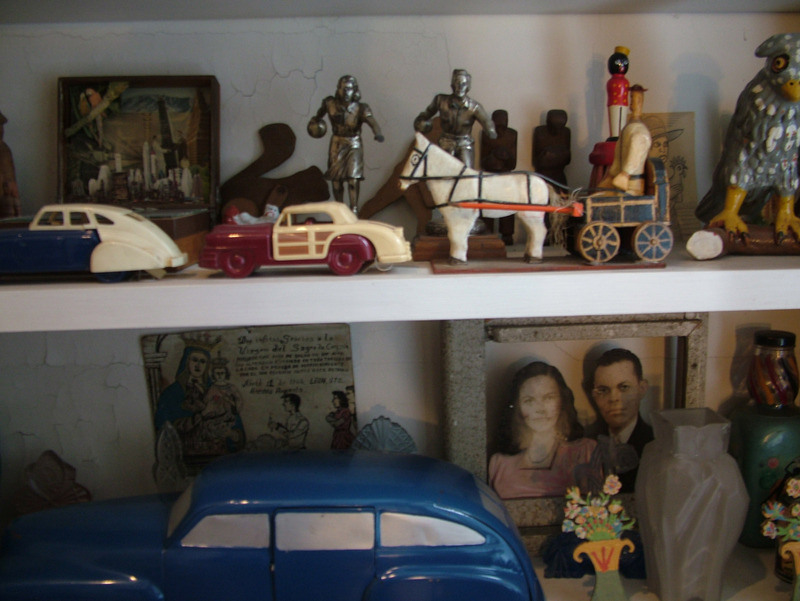 At Roger Brown I always show everyone the medicine cabinet, still filled with toothbrushes, Maalox, cotton swabs and other typical accoutrements. I saw the house shortly after Roger donated it to the School of the Art Institute in 1996, the year before his death, and was struck at that time by its time capsule quality: underwear stacked neatly in the closet, toothbrushes in the medicine cabinet, spice containers in the kitchen. The details of everyday life. The fact that I can still see that medicine cabinet is oddly comforting. At times we feared that the School would deaccession the building. While the collection might be saved in that scenario, to have the collection in its original context is geometrically more educational. 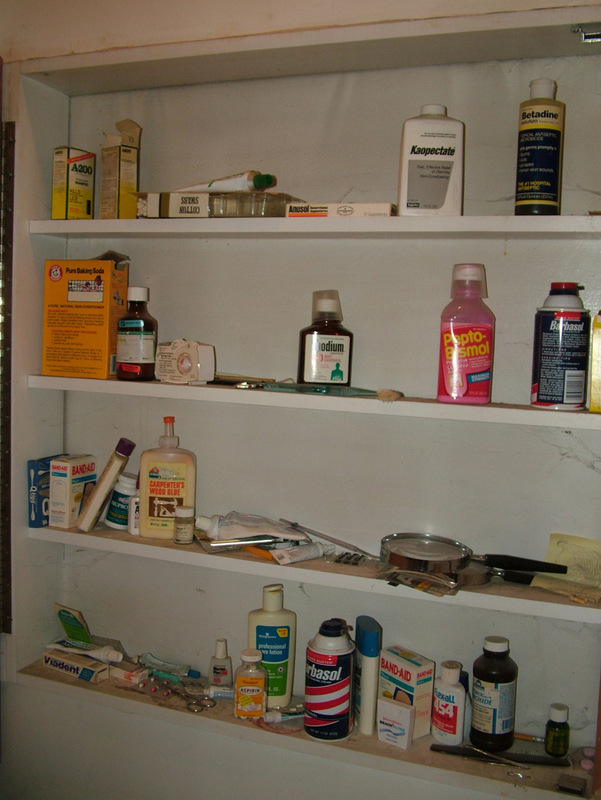 Somehow the medicine cabinet is that slice of everyday which grounds and makes real the rest of the collection. It is striking the various educational programs that have taken place in the building. 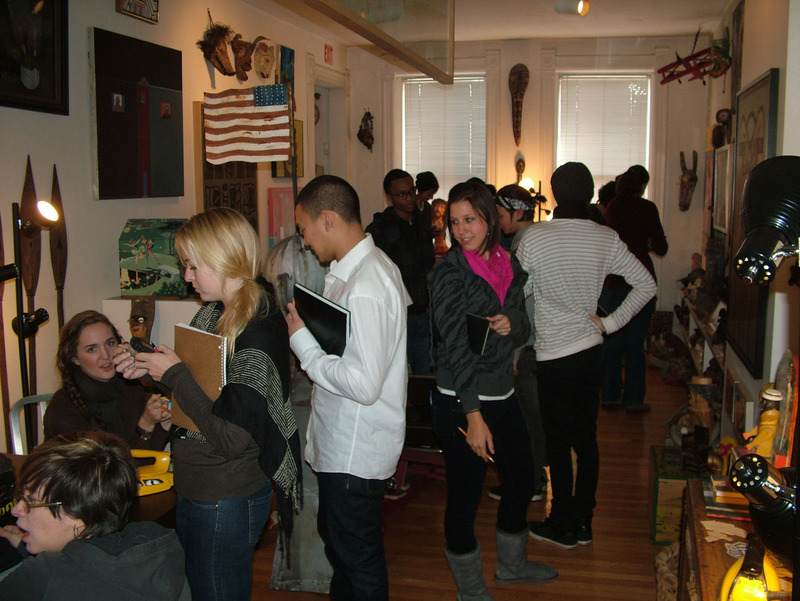 Our historic preservation graduate students restored the storefront in Neal Vogel’s class and cleaned graffiti from the side in Bill Latoza’s class and have helped document the collection and assess the building. 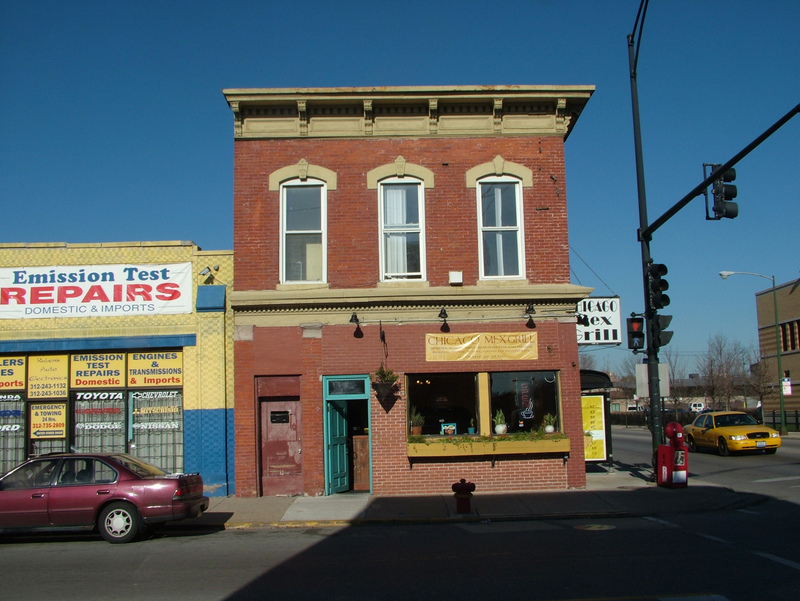 This past Spring we did an interpretive project for the adjacent Armitage-Halsted District and met with Alderman Vi Daley in the building during and after the project. Like Hull House, the Roger Brown collection is not simply preserving a place and its objects: it is preserving the purpose of a place by extending that purpose. 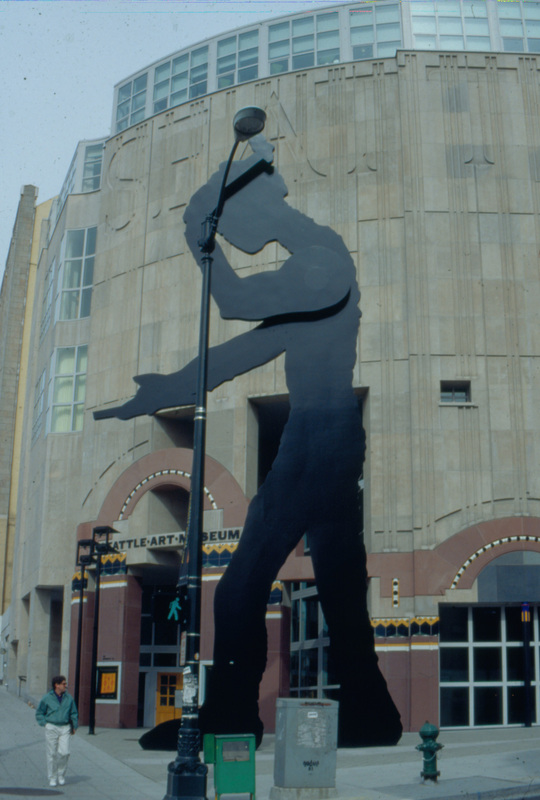 Roger Brown made art in this building and a world of art and artists swirled through its interior for two decades: after he moved to California the gallery Intuit occupied the first floor. 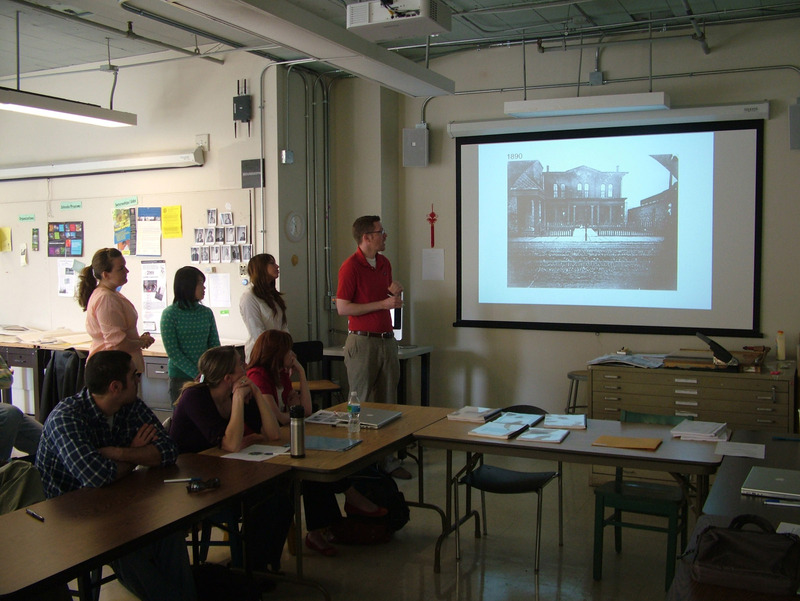 The School of the Art Institute is not simply preserving the building, it is preserving the importance of the building by extending that artistic and educational mission dozens of times every single semester with students of every age and background. That is what our field – heritage conservation – is all about. 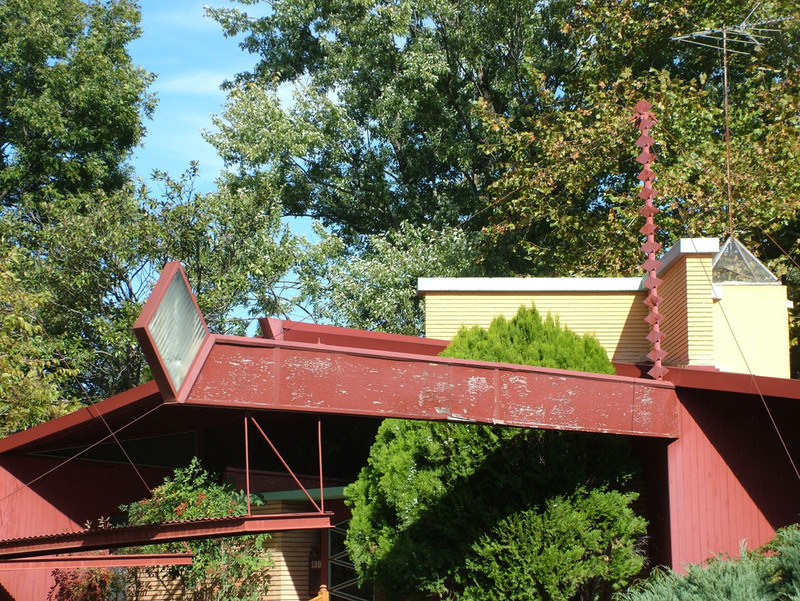 November 2010 UPDATE: The Roger Brown Home & Studio is about to be listed on the National Register of Historic Places! Great work by Susannah Ribstein and of course Lisa Stone. My children come into the house and throw their bags, coats and shoes on the floor and proceed to tread upon them. They go running around outside with their socks on, quickly ruining said socks. They lean back on chairs and ottomans and I have had to repair the ottomans four times in the last year. They leave doors and windows open, lights on and leave candy wrappers on bookshelves. This is what kids do, and we try our best to correct these habits. But we have bad habits of our own. It is cold today, and I need to close the storm windows, and that attic window I meant to repair this summer is still loose. I shoveled the front steps but I didn’t shovel the back steps. I need to call someone about the right front burner on the range and perhaps I need to change a water filter and I definitely should get someone to check on the furnace and radiators. Another summer project left undone – painting the outside of the attic windows. At least we got those chimney caps on last year. The point of this exceedingly boring rundown is one of the most important aspects of conserving historic buildings: maintenance. 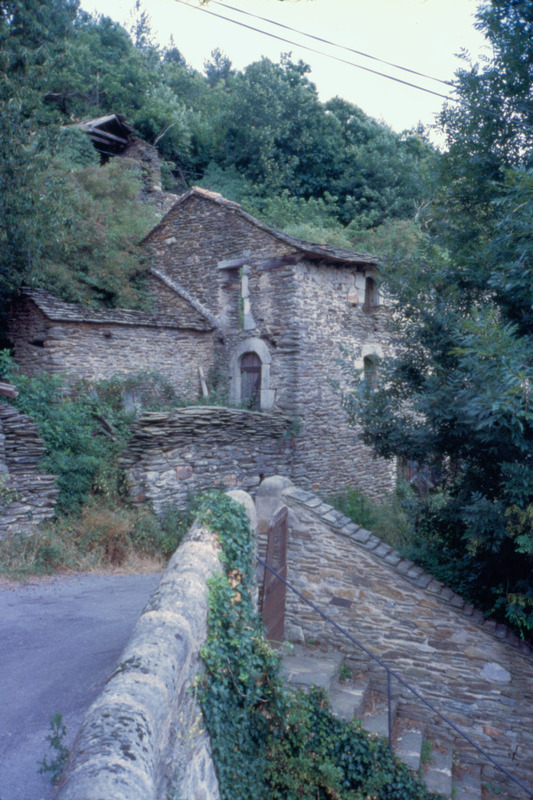 I have to thank my high school friend Jenny Brezon Fluteau, who emailed from the south of France, where she and her husband make wine and champagne. She said she had a big old house that had been poorly maintained and could use help. I replied that I had the same house. When people complain about the expense of historic preservation, what they are usually talking about, in fact, is the expense of deferred maintenance. The $100 problem ignored until it becomes a $1,000 problem. Or a $100,000 problem. My favorite $1,000,000 problem was one I encountered during the effort to save St. Mary of the Angels church in the late 1980s and early 1990s. The massive brick walls were cracking and the interior of the dome was flaking paint and plaster. It was water damage, and everyone knew it was because the building was old. No, it wasn’t. It was because the building had not been maintained. This is a pandemic problem with houses of worship, usually operated by people NOT trained in the management and maintenance of buildings. And they are very big, very complicated buildings. 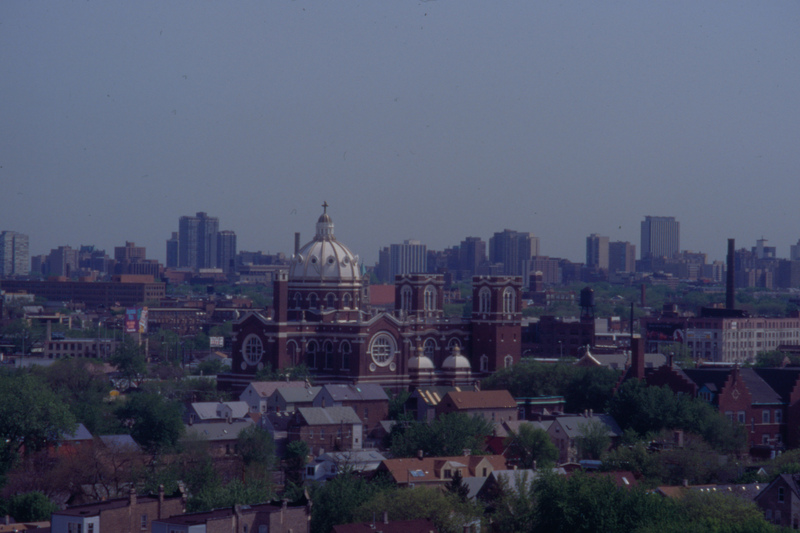 At St. Mary’s, a variety of roof patches over the years – perhaps done by well-meaning parishioners – had led to a buildup of roofing tar in the gutters, which were blocked. So the water was running through the walls. It was a million-dollar problem caused by the poor – and repetitive – application of a $100 solution. It was not because the building was old. In fact, it was still standing BECAUSE IT WAS OLD. They built things very well in the 1910s and many of those buildings can stand an incredible amount of abuse. They can stand much more abuse than my recently purchased ottomans, or the kids’ snowboots, or their socks. 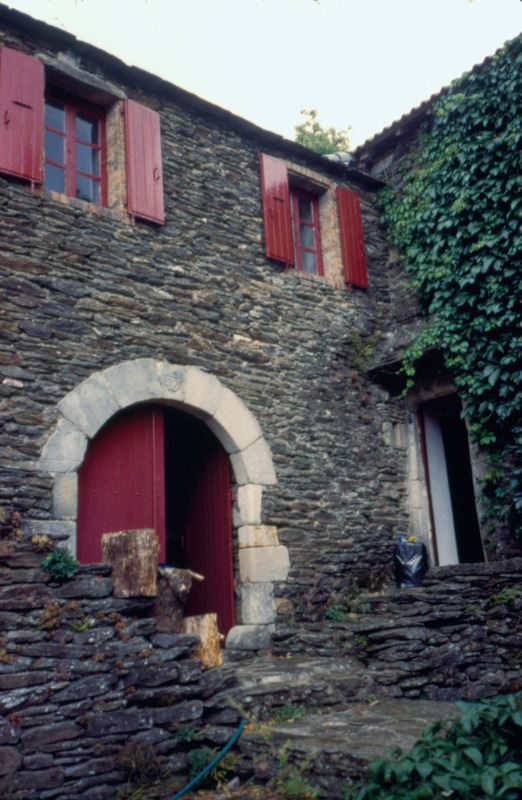 In reality, a well-maintained house built in the 19th or early 20th centuries (and even many well-crafted homes from the later 20th century) is less expensive than a new vernacular house IF IT IS MAINTAINED. That is a big “if” because it almost never is. We live in the ether of the myth of maintenance-free. NOTHING, nowhere, ever, is maintenance-free. Our myth of maintenance-free is a byproduct of the consumer culture that encourages replacement. 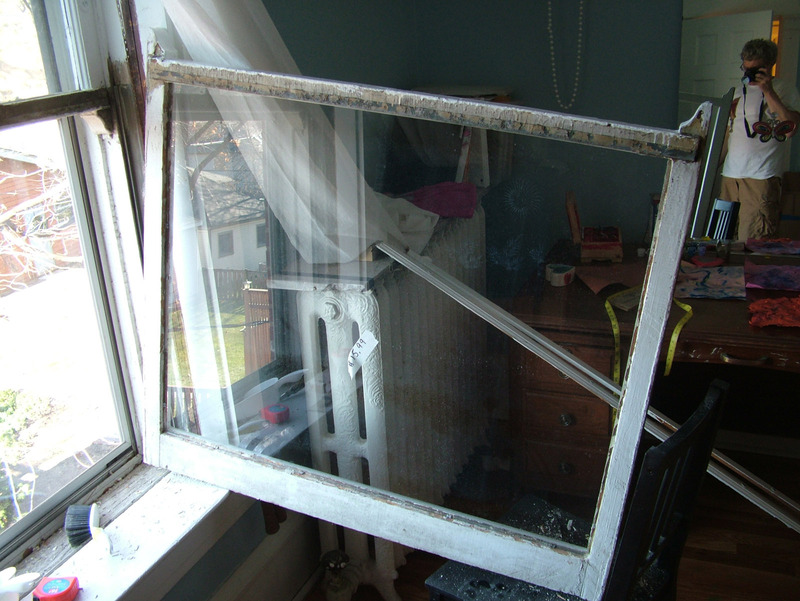 New replacement windows are maintenance-free because when they break, you throw them out and buy new ones. A new boiler is maintenance-free until it gets old. Same with a new fridge or a new door or a new floor or a new paint job or the Mount Olympus of maintenance-free mythology; artificial siding. You will never paint again because the siding will disguise the disintegration of your walls until it is time to replace EVERYTHING. There is a design issue here as well. 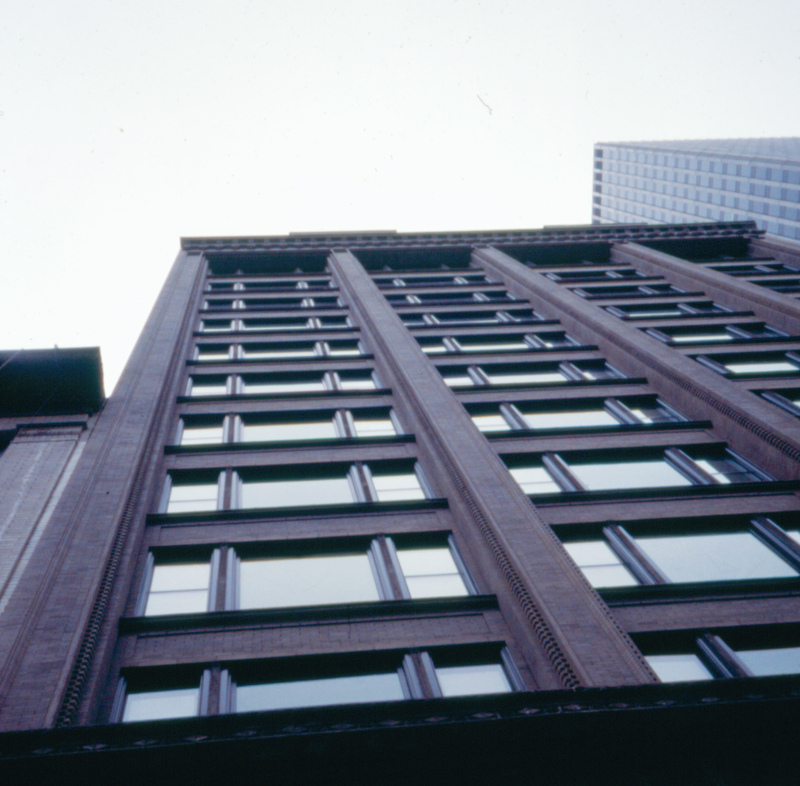 Prior to 1930, almost every building was designed to be repaired, and its components were designed to be repaired. IN the postwar consumer culture, our economy depended on REPLACEMENT rather than REPAIR. 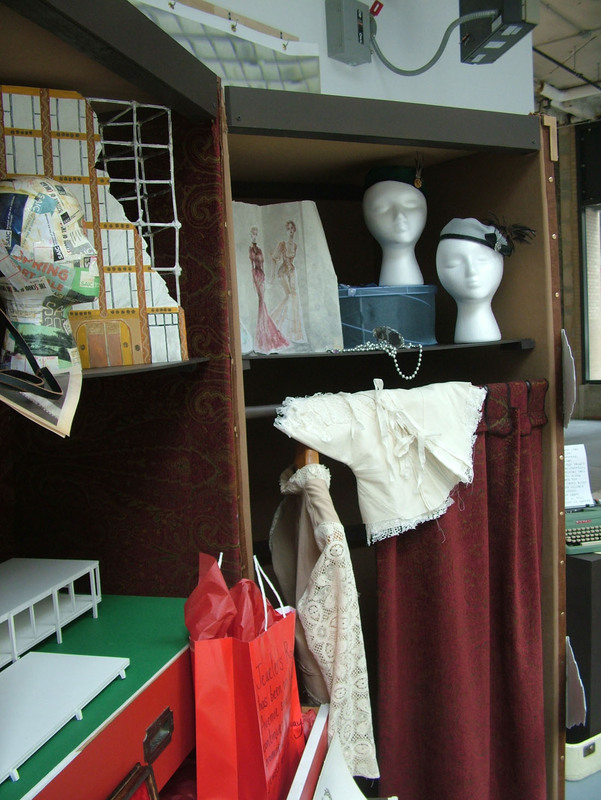 It was economically advantageous to buy things that needed replacement, and those things included houses. I have spent two decades telling anyone who would listen that most new houses are not built to last as long as their 30-year mortgages. NO ONE has ever told me this is wrong. It is an economic and technological fact, by and large. You can’t sand and refinish a floor that is studs, layers of plywood and carpet. Good stuff can be repaired. Good clothes can be mended, and shouldn’t be thrown on the floor and trod upon, as I try to tell my children. Good appliances can be repaired. Good houses can be fixed as well. And they shouldn’t be neglected for years. 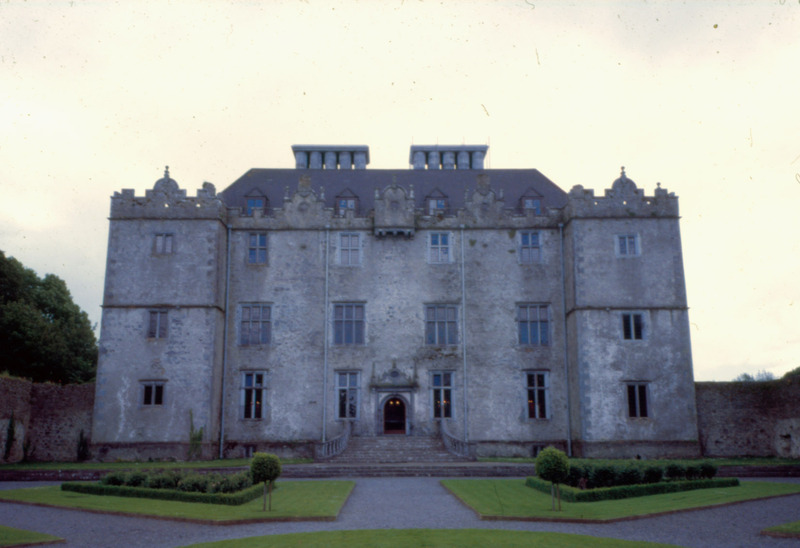 Historic houses are often so darn good that they can still be fixed feasibly EVEN after years of neglect. But that is usually what makes them expensive – the years of neglect. 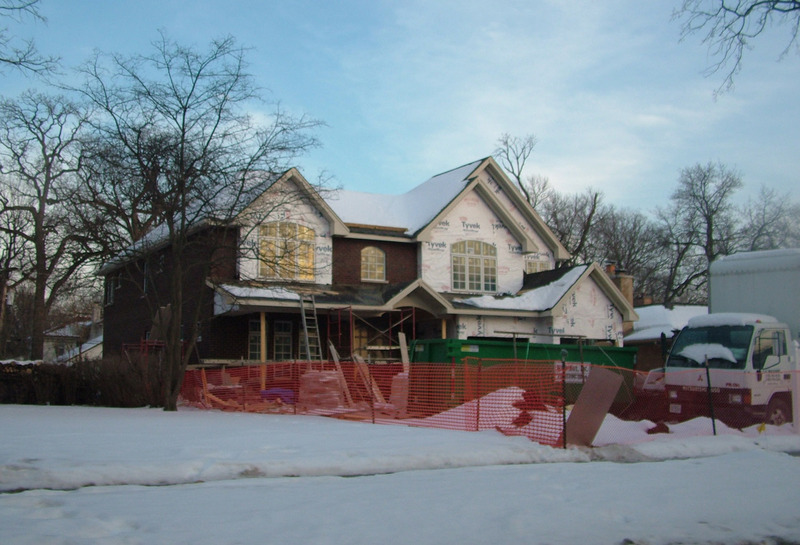 If I get to all my projects on my house, and bring it back from the neglect it has suffered, I will still need to remain vigilant and spend money and time on it every season of every year. Buildings, like cities and like people, need constant care, feeding and attention. Especially if you are worried about spending a ton of money. 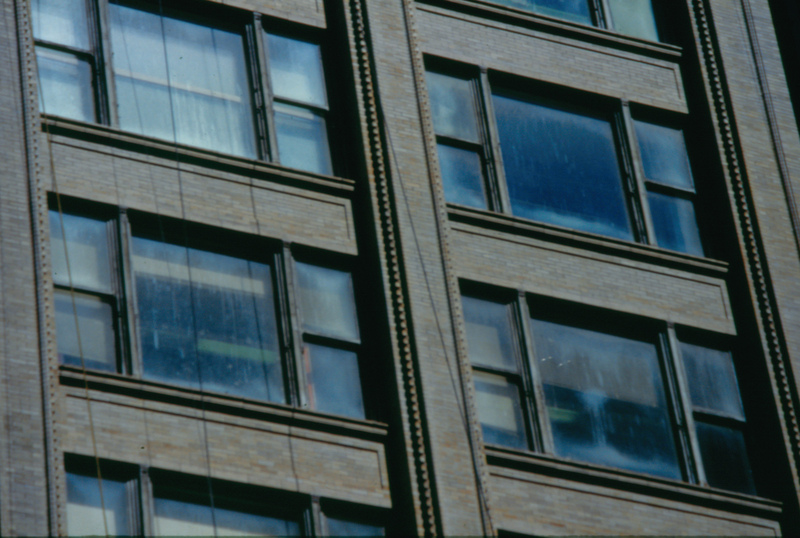 Chicago photographer and preservationist Richard Nickel once said that the only enemies of historic buildings were water and stupid men. If you let the water in, the building quickly deteriorates. If you keep the water out (that is why you always fix the roof first) you have time to address other issues. But the best thing is to MAINTAIN the building over time, like the auto enthusiast who worries about changing the oil and the brake fluid and the transmission fluid and rotating the tires. 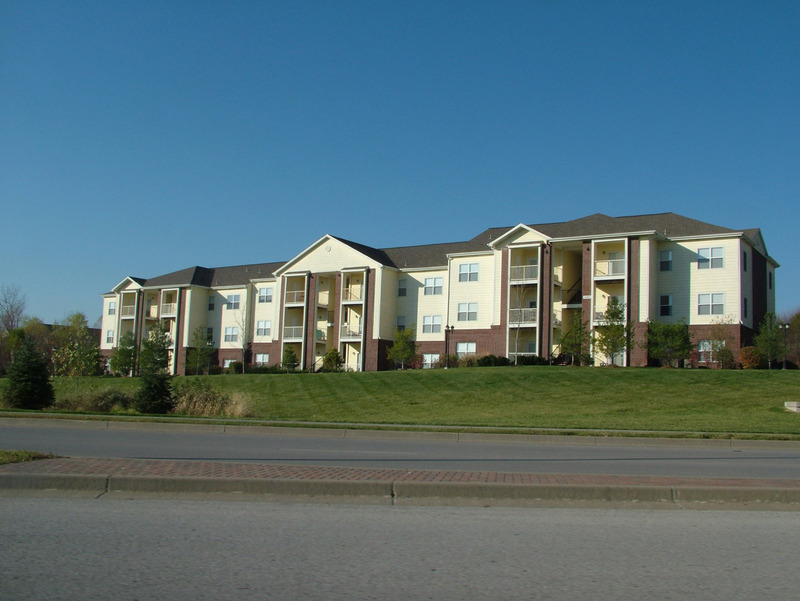 Most massive building problems start out as little leaks and flakes and tiny failures that are ignored – usually for frightfully long times. 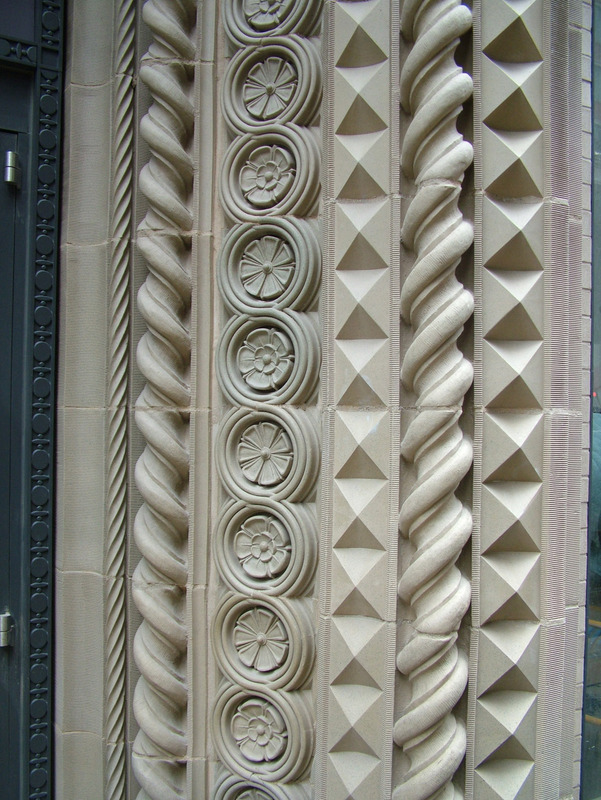 Building conservation is not inherently expensive if it is approached as an ongoing task of maintenance. If it is a rescue operation after the passage of a catastrophic amount of time, then it can be. I own a house in a historic district and last year I blogged about how thankful I was for that fact. Real estate is an asset whose value is largely external – it comes from its location, which is to say, its surrounding buildings and environment. Because my house is in a historic district, its value is assured. Economic studies for over 40 years have confirmed this fact in communities across the United States. 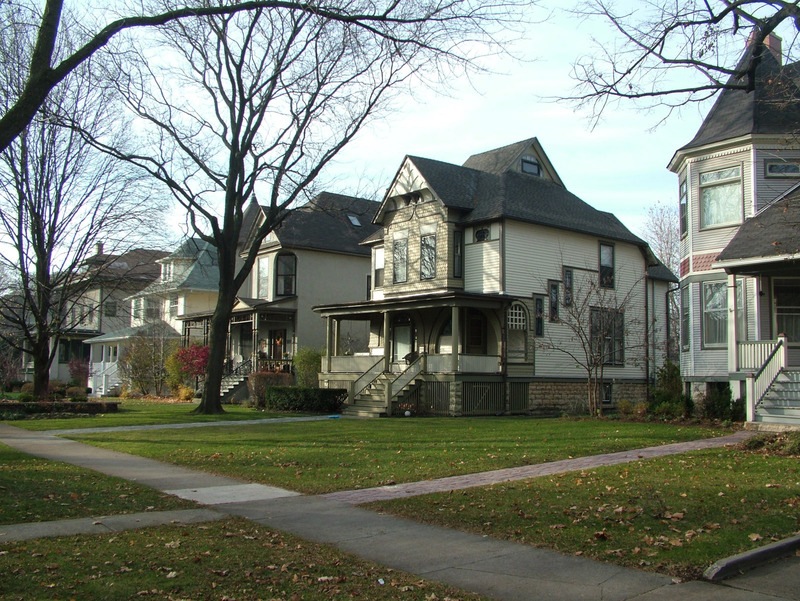 If you look at the history of historic districts – which I did in my dissertation – you find that the first modern historic districts emerged in the 1950s in communities that were concerned about drastic changes to their environment and thus the value of their homes. 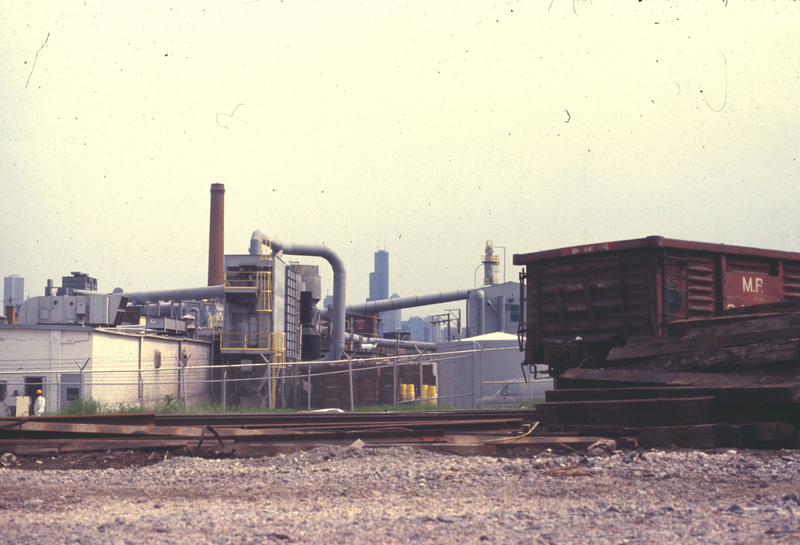 Urban renewal was one threat, which proposed outright demolition. The other threat was posed by postwar zoning ordinances, which dramatically increased density and thus owners of brownstones or single-family homes faced the prospect of massive highrises next door. So homeowners in places like Beacon Hill in Boston and Brooklyn Heights in New York did what their forefathers did a generation earlier with zoning: they crafted legislation to protect their environment and thus their home value. 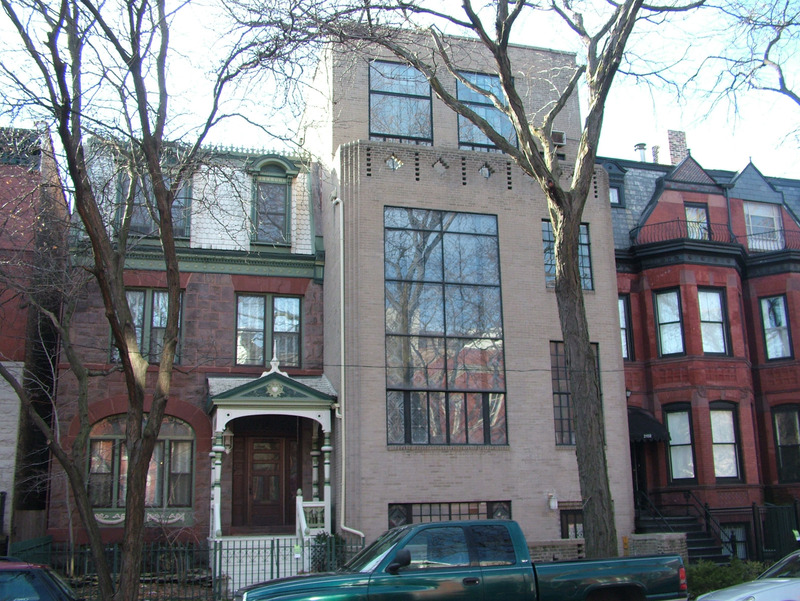 Often they also secured downzoning – this happened in Greenwich Village in 1961, and in Chicago’s trio of lakefront landmarks in the 1970s – Astor Street, Old Town, and Mid-North. Now, some people, motivated by greed or some sort of Ayn Rand ideology, argue that they don’t want historic districts because it will limit their value. How can this be true? Well, we have the examples of teardowns, where people are able to cash in on windfall profits because they can tear down a house and build a bigger one. The libertarian ideology goes right out the window as soon as you realize that what allows the teardown is zoning: it’s just another government handout. In fact, the zoning that makes teardowns possible and profitable ALSO protects the value of some of those teardowns by insuring that I can’t build an abbatoir next door. Indeed, that it why a Supreme Court Justice (Sutherlan – who was as conservative then as Scalia is today) upheld zoning in 1926. So people who bought houses wouldn’t have knackering houses next door. Historic districts were born at the same time as zoning and for the same reasons and they are in fact simply a more precise and surgical tool compared to zoning, which can sometimes be a blunt instrument. They also secure value, and I will not be surprised when some teardown neighborhoods hit the skids when McMansions start falling apart in 2020 during the height of the baby bust. After all, I have seen how they were built. 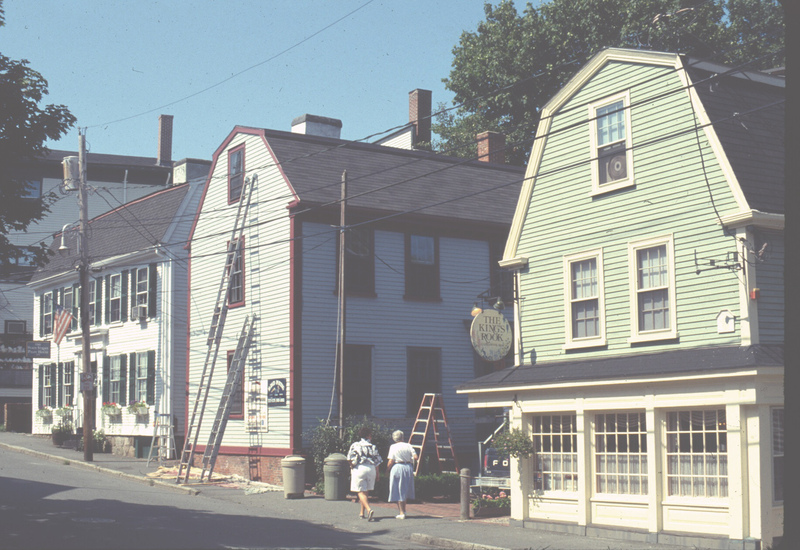 There is a vital economic principle at work in historic districts: uncertainty. The reason people get all NIMBY about things and fear change is simple: they fear uncertainty. This has economic agency because uncertainty discourages investment and consumer confidence and other things that are seen as positive for a growing economy. This is another stick in the eye of free market ideologies, because in reality, markets only operate well under conditions of security and certainty. Bandits and plagues and earthquakes are generally BAD for markets. 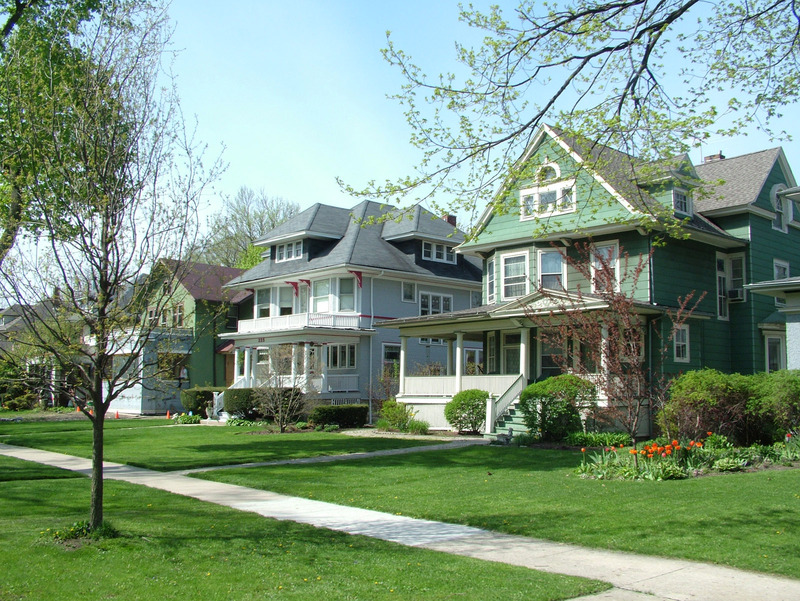 Historic districts, like other zoning devices, create a sense of certainty that insures value over the long term, even if it might discourage short-term windfall profits. Historic districts create another alchemy which led me to question one of the basic assumptions I have been talking about here. Ownership. We want the certainty of a stable environment to preserve our home value, an argument Dartmouth economist William Fischel has made excellently. 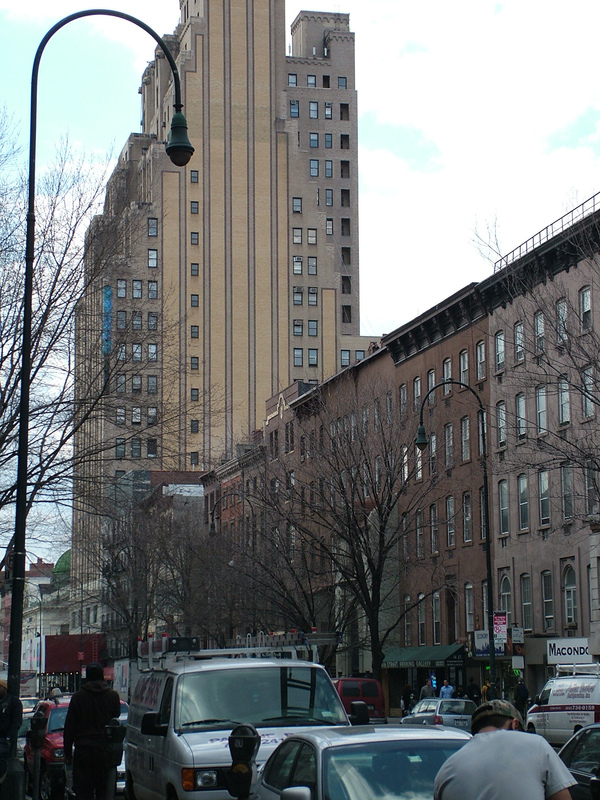 But I also studied historic districts in Manhattan, and found a strange condition. People wanted historic districts and the certainty of an attractive, healthy and wealthy environment, but they didn’t own. 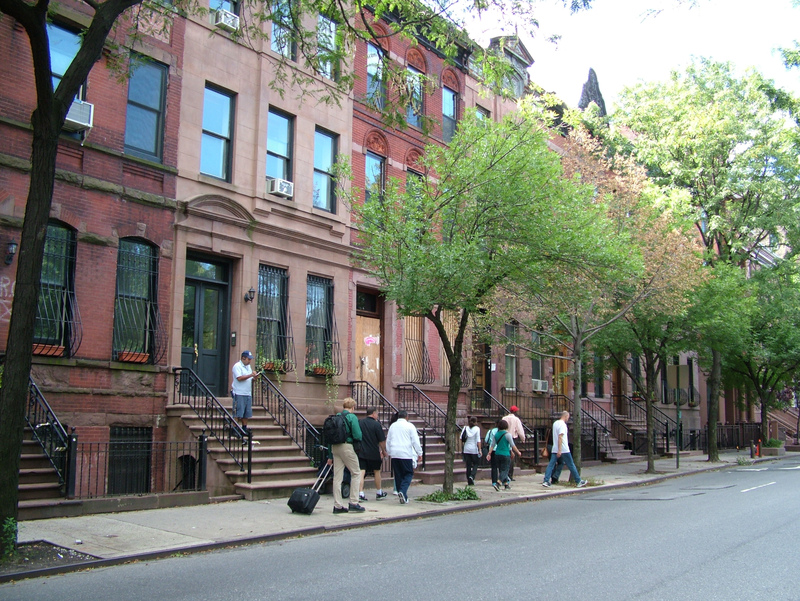 A majority of the residents of places like Greenwich Village and Hamilton Heights were renters, not owners when they sought historic status. 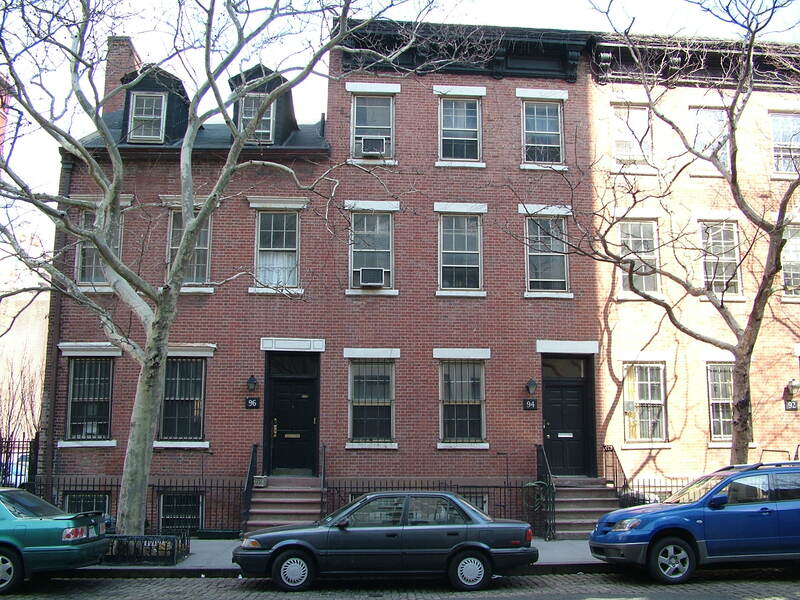 Moreover, I found that renters were investing tons of sweat equity in Greenwich Village rentals from the 1910s onward. This counters the ownership and equity theory. Why? I think it comes back to the certainty principle. You might have equity, but that is an abstract concept. 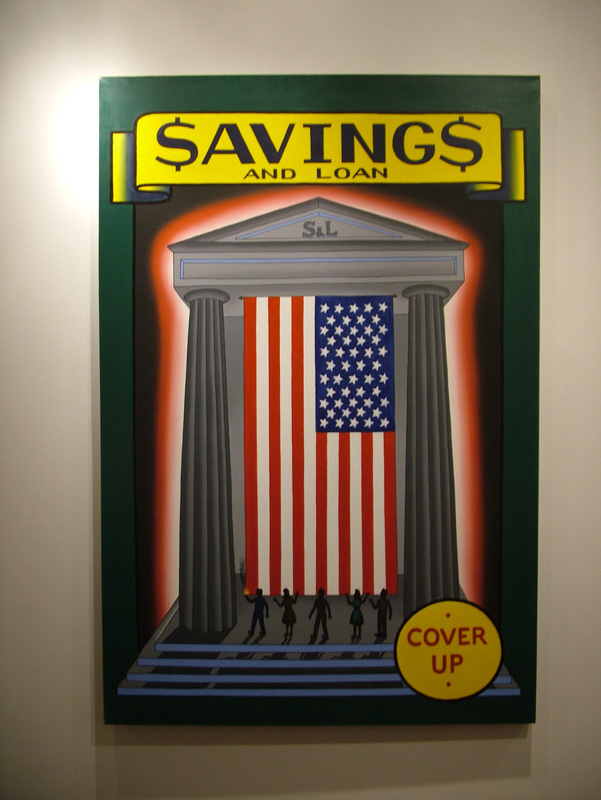 And in the 2009 world of upside-down mortgages, it has proved often illusory. But where you sleep and eat and the buildings and streets you travel to work and shop and recreate – those are real. They are certain, and you derive value from your environment whether or not you accumulate value in it. You can’t take it with you. But you can have it with you all the time you are here. As long as I live in a historic district, I will have this value and this certainty. You are currently browsing the Time Tells blog archives for December, 2009.